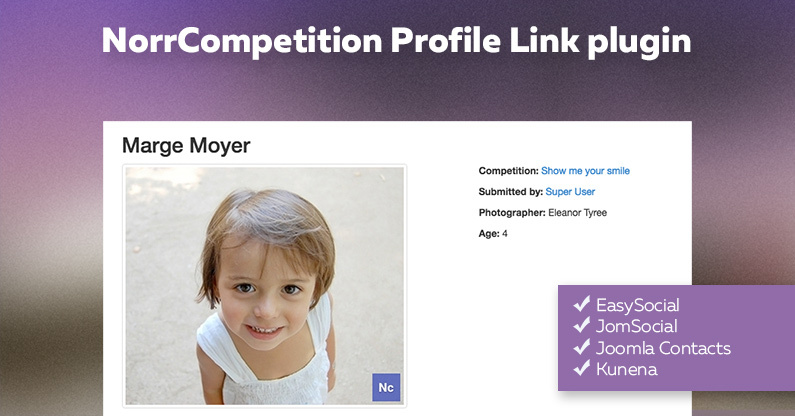 Today we have released a new plugin for NorrCompetition which generates links to profile of Contestant (user). You can select component the plugin should be integrated with. There is a way to display Contestant's name at entry page and this plugin adds URL that leads to user profile. It increases interaction with 3rd party extensions. NorrCompetition Profile Link plugin has been included to core NorrCompetition package and is available to download to all users with valid subscription. This plugin is our first step to provide integration to 3rd party extensions. We have started the work on a new plugin that will post some actions performed in NorrCompetition to EasySocial activity stream. Also EasySocial will be developed to display the list of submitted entries in a user profile. Both extensions will be released as commercial add-ons.